Meditation has proven its advantage for people of all walks of life be it be Corporate America, educational institutes, health care organizations, prisons, veterans from war-field, etc. Very captivatingly, Ariaana Huffington shares about meditation and its connection to Corporate America. Likes of Melinda Gates and many successful giants attribute their accomplishments to their meditation practices. There are enough studies proving the benefits of meditation to individuals in improving the quality of life. My purpose of writing this piece is to go beyond the individuals and share the influence of meditation on the whole world collectively. 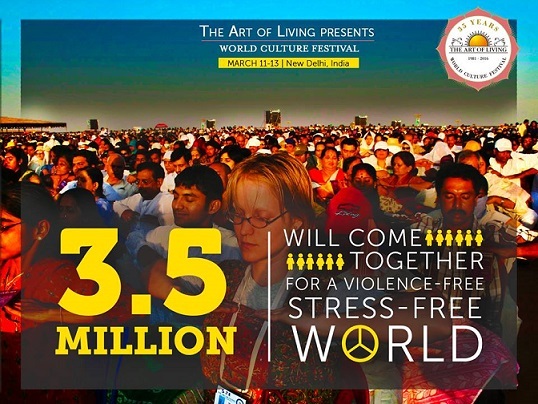 When I heard that 3.5 million people from 155 countries meditating together for world-peace during World Cultural Festival (WCF) happening in New Delhi, India on March 11-13, 2016, I had a question- will it really create the impact? This is so much thrilling and worth the world's attention that I decided to talk to Bhanu Narasimhan, sister of Sri Sri Ravi Shankar, the founder of Art of Living, the organizer of WCF. She shared some very thought-provoking insights. I researched further to satisfy my rational mind. Here are 3 strong science based reasons why a meditator should meditate for world peace in such massive gathering. 1. We are all ONE! "It is not about individuality or certain sections of society. It is all about recognizing that we are all connected and part of one universal being. We all are governed by vibrations. A happy person can make us happy and an unhappy person spreads unhappiness. When glaciers melt due to global warming the water levels rise around the planet. Global warming is such a glaring reminder that we cannot isolate ourselves." "There is far more evidence that group meditation can turn off war like a light switch than that aspirin reduces headaches. It is a scientific fact." that our consciousness can change the physical world around us by altering the energetic field. An experiment conducted during the Lebanon war in 1980s showed that when 1,000 people in Jerusalem meditated on world peace, war deaths in Lebanon went down by over 75%. Not only did war deaths go down, but crime and other destructive happenings also went down on the days the group meditated. Imagine what would be the effect when 3.5 million meditate together!!! "When thousands of people come together with the single intention of creating a more peaceful planet, it is certain to manifest." The event will also demonstrate how diverse world cultures can coexist peacefully celebrating each other. In the midst of the widespread terror in the world, it's important for all the good people to stand united making the voice of peace louder and stronger. Global meditation will create a field of peaceful and positive vibrations spreading across the planet." According to the super-string theory in physics, waves of vibration flow from everything in the universe affecting the collective consciousness of others. Groups can enliven that field. Group meditation can be similar to a tug of war. You are all pulling on the same side, certain synergy of energy is created and a common goal is achieved. It is the same when you meditate together, collective consciousness raises, it acts like the 'rising tide that raises all boats.' And the peace that is created actually becomes palpable, which is a special, collective experience and accomplishment. Let's join the Peace Synchrony! "When in life you will get the whole world on one platform? Experiencing the magnificence of such a global get together, united in the spirit of love, service and peace for the world, would be life transforming and unforgettable. Seeing so much harmony in diversity broadens our vision and deepens our roots." left a deep impression on me. I grew up visualizing about myself contributing for world peace. I am amazed to see how the universe is creating occasion for me to fulfill my cherished dream! For sure, I am going to be part of this largest and most spectacular gathering for peace in modern history. To join World Culture Festival and be a part of the peace making, click here.